Here is my 4 part Git video tutorial all on one page. I cover the different types of version control. We look at the difference between modified, staged and committed. We install and set everything up for Windows, OSX and Linux. I go over using VIM and show how to set up other editors. Then I cover the commands init, add, commit, status, diff, rm, log and pretty much everything else. I hope everyone finds this useful. Git Video Tutorial : I cover the different types of version control. The difference between modified, staged and committed. We install everything for Windows, OSX and Linux. I briefly go over using VIM and show how to set up other editors. Then I cover the commands init, add, commit, status, diff, rm, log and more. 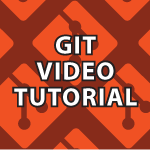 Git Video Tutorial 2 : I’ll cover using GitHub and remote repositories in general. We’ll push and pull data from GitHub and to GitHub. We’ll also take a look at remote, fetch, tagging, aliases, clone and much more. Git Video Tutorial 3 : I cover Branching, HEAD, Checkout, Rebasing, Reverting, Reset, Clean, and Mergetool. I also spend some time explaining what happens when you commit and how to solve merge conflicts. Git Video Tutorial 4 : I will answer a bunch of questions I have received. We’ll cover how to generate and use SSH keys locally as well as on GitHub. We’ll then look at how to set up multiple GitHub accounts on one computer. Through this you’ll easily be able to change accounts with one simple command. Then we’ll look at some examples on how the Fork & Pull workflow works on GitHub.